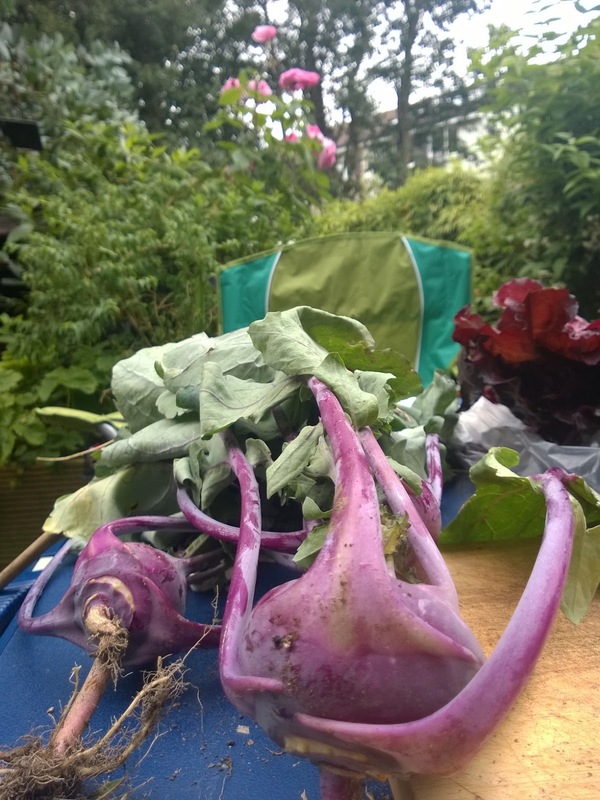 My energy levels have been iffy this week so we haven't made it up to the allotment since the weekend, but we still have much of our last harvest in the fridge to enjoy so I thought I'd run through some of the latest successes and failures. The potato harvest has been really exciting, despite a bit of damage from keeled slugs (hiding away under ground and munching on our taters). We grew a few varieties but really should have been more organised and written down what they were - no way now of knowing which variety it was that produced lots of little spuds and which just had one big potato per plant. Something to consider next year. We just grew first and second earlies to avoid problems with blight and this seems to have worked really well. The bed the kids are harvesting here was a big surprise that we got a harvest at all since the seed potatoes started to sprout too early and were hastily stuck into cold wet heavy clay at the beginning of the year.They never really looked like they would amount to much, but they apparently beavered away under the soil and provided us with a few meals anyway. 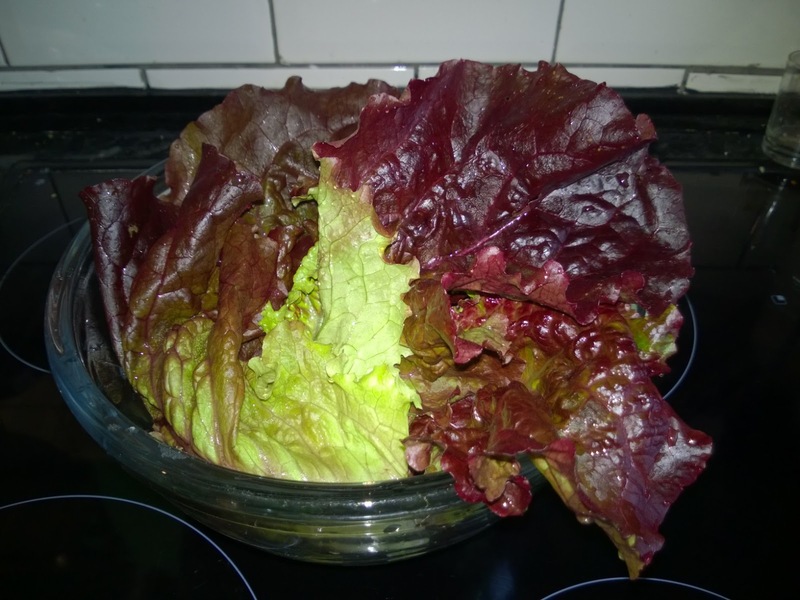 Lettuces have been a surprise success, especially these red (possibly Batavia?) ones. The first time we sowed the bed not one thing germinated (pigeons? ), so we sowed again in module trays at home and planted them out under netting. These are great, not much bug damage or unwanted visitors to wash out, they're firm and crisp and tasty, just like a shop one as Ollie pointed out. 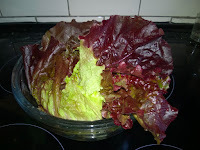 Also from the lettuce bed we've had brilliant kohl rabi. Unless you get a veg box delivered this is something that you don't normally see here in the UK so it's been great to have had it do so well (very tasty grated into slaw). Cabbages, sprouts and broccoli are all looking promising in this netted patch too. 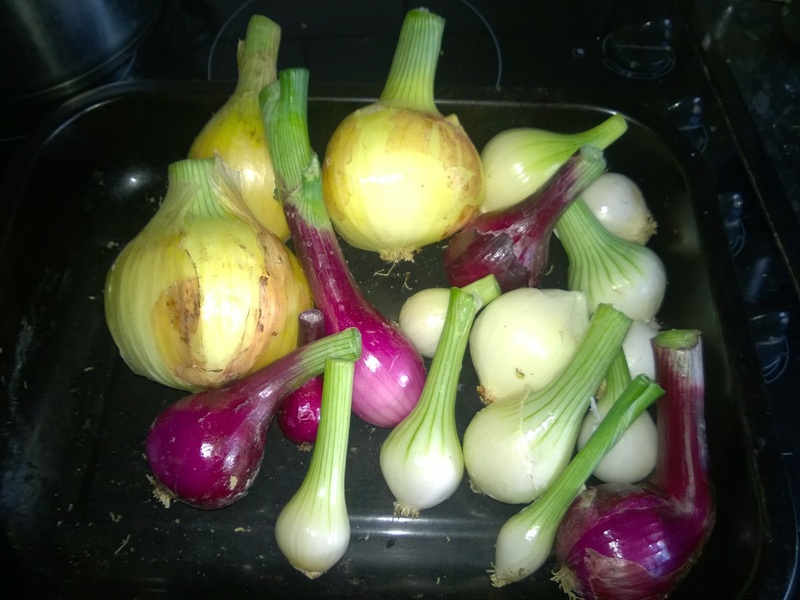 Onions are still doing well. These were mostly from 50p a bag sets from Lidls so a good bargain which makes it worth having grown them financially as well as for fun. We grew shallots for the first time ever successfully too, which has led to another first - making pickled onions. 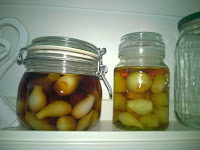 I've made one batch in malt vinegar and the other in cider vinegar. The kids love them so I don't think they'll last much longer on the shelf. Lots of failures too, a mixture of inexperience, time and conditions. The French and climbing beans haven't fared well at all in the dry hot windy weather we had when we planted them out. I think one of each survives. At home the courgettes all get blossom end rot and drop off, victims of insufficient water or fertilizer perhaps. The radishes were decimated by flea beetles and the turnips and swedes never germinated at all. Four trays of seedlings snuffed it due to under watering. We've had plenty of strawberries from home but not one from the allotment (a squirrel apparently took a fancy to them). Nonetheless we have been surprised by the success of the things that have grown well, given the very heavy clay soil, the infestation of bindweed and the trampling by small boys. 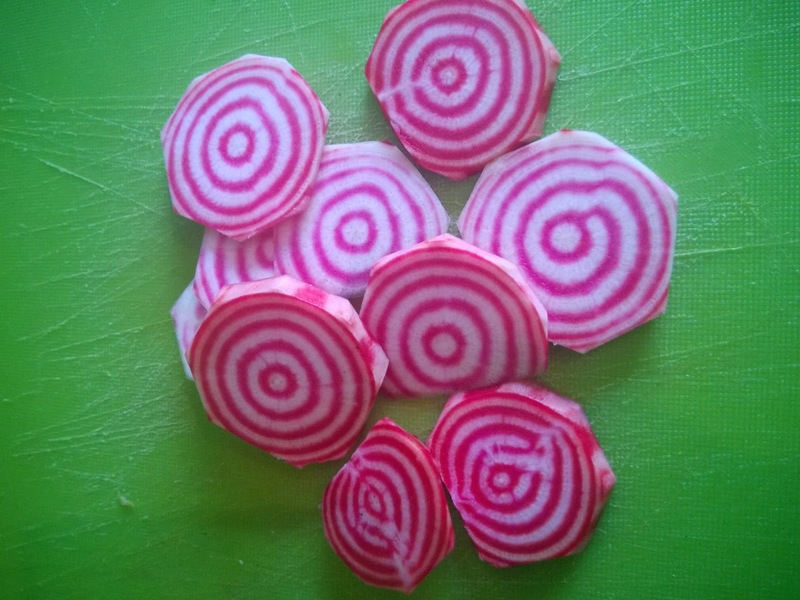 Visually my favourite allotment offering has been these Chioggia pink beetroots. Stir fried they retain their candy striped colour and grated raw in a salad they look and taste really pretty. 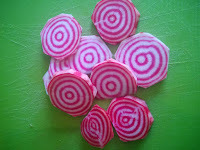 All the benefits of beetroot but with none of the red staining. 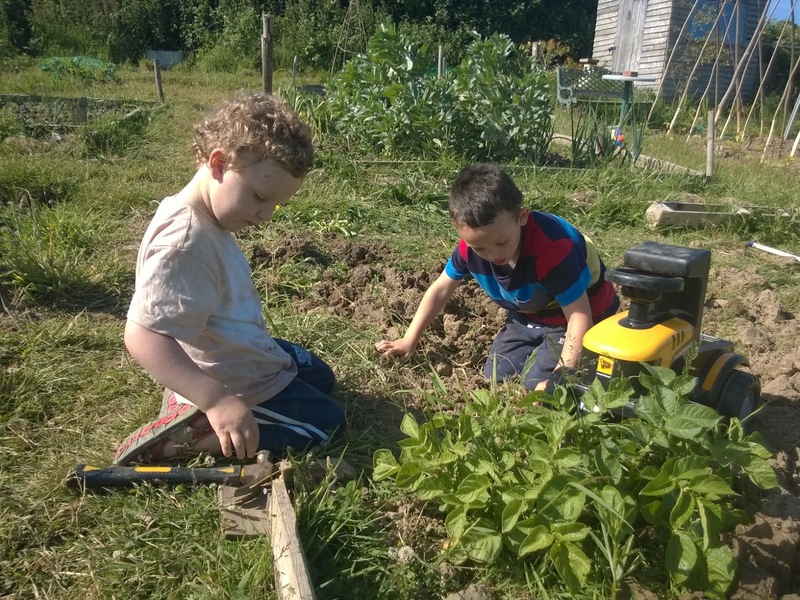 It does take a lot of time and effort, but it's such a good experience for the kids and a brilliant resource for food and fun I'm still really grateful we had the opportunity to gain a space to grow. For someone who likes food it's also a better incentive to exercise more than jogging, I don't think my waist is any smaller but my watering can carrying muscles are definitely firmer!